encourage even the youngest of students to experiment with their own illustrations. With this lesson they will be better able to create their own game scenarios. Crockett Johnson was actually a pseudonym used by David Johnson Leisk the cartoonist. As an illustrator, he produced more than thirty books for children, and many of these have remained favorites in teachers' and young children's collections. He collaborated with his wife, Ruth Kraus, on another favorite book, The Carrot Seed. Gather your students together for story time and introduce them to Harold, the hero of the book. Share the story and then ask the children what they liked best about Harold and the Purple Crayon. Discuss that the moon is on every page. Go back through the story and locate it. Ask why they think the author has included a moon in every scene. Discuss if the story is fiction or non-fiction. This may lead to a discussion about Harold's imagination and how it is acceptable to go for a walk in the moonlight in your imagination but that it would not be acceptable to go for a walk on your own in real life. Point out to them that the pictures are very simple and that they could easily draw similar ones. At this time you may like to tell the children that copying exactly someone else's idea or picture, and pretending it is yours, is called plagiarism. Explain to the children that they are going to make up their own game about this book. You may like to make a list on chart paper of objects that would be simple to illustrate, e.g. button, cat, house, comb. Provide every child with a sheet of black paper and demonstrate how to fold in half and in half again, and in half again, into eight sections. Open out the paper so that the eight sections are visible. Instruct everyone to draw a moon in one section of their paper. The children will now take it in turn to name an object. The other child will draw that object in one of the sections on their paper. If they are having difficulty thinking of different things, remind them that they can use the list that you created earlier. When they have filled in all eight sections, ask them to cut out each section, or ask a helper to do this. Put all 16 sections in a pile between the partners. Now each one take it in turn to pick up a card and tell a story about that picture. If they turn up a moon picture, they can choose to pick another card or they can tell their partner to pick the next card and tell the story. As the children become more familiar with the game, they could choose two cards from the pile and link the stories together. The beauty of these sets of cards is that they can be used over and over. The cards could be stored in envelopes, and when students are looking for activities during free time they could partner up with someone else and make up more stories. Some children may enjoy making finger puppets to match the stories and sharing them with the rest of the class. The cards could be laid out and then the students could match all the ones with the same beginning sounds, e.g. cat/comb, or those that rhyme, e.g. cat/mat. The possibilities are endless and, best of all it, is fun and inexpensive. 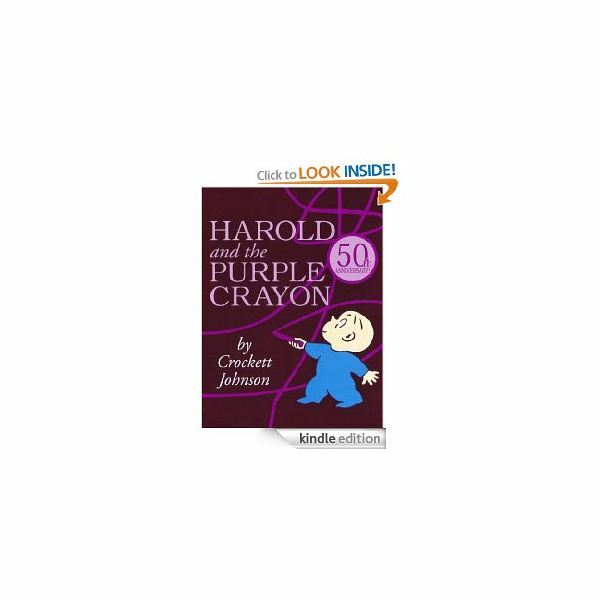 What satisfaction the students will feel knowing that they have invented their very own Harold and the Purple Crayon game!